The 8hp-27hp Briggs and Stratton replacement engines and engine parts listed are mostly used for replacing a riding mower Briggs and Stratton Engine, also known as a lawn tractor or garden tractor. These Briggs and Stratton Vertical Motors are also being used in more economical residential Zero Turn Mowers. Commercial Zero Turn Mowers more frequently use a Kohler Engine, Honda Engine or Kawasaki Engine. 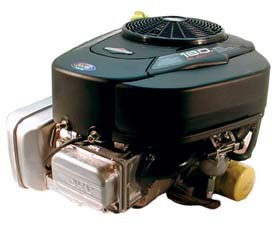 The Briggs and Stratton replacement engines and engine parts you see on this page are priced very competitively and also ship for only $7.95. Please match either the Model-Type # needed or the crankshaft and/or alternator if equipped. 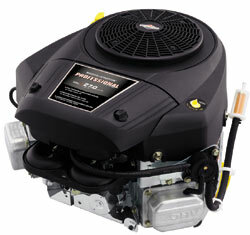 We also carry aftermarket and genuine original equipment Briggs and Stratton Engine Parts if needed. The Briggs and Stratton replacement engines and engine parts listed below are all brand new and come with a full manufacturer’s warranty. These Briggs and Stratton motors for sale are all Current Production Engines - No overruns - also known as manufacturers leftovers, or out of production engines. Why the sticker may say a different Hp rating now. HP Rating as stated per Briggs and Stratton Website - "Net power values are taken with exhaust and air cleaner installed whereas gross power values are collected without these attachments. Actual gross engine power will be higher than net engine power and is affected by, among other things, ambient operating conditions and engine-to-engine variability. Given the wide array of products on which engines are placed, the gasoline engine may not develop the rated gross power when used in a given piece of power equipment. This difference is due to a variety of factors including, but not limited to, the variety of engine components (air cleaner, exhaust, charging, cooling, carburetor, fuel pump, etc. ), application limitations, ambient operating conditions (temperature, humidity, altitude), and engine-to-engine variability." In short ratings used to be gross HP and now are Net Rated. So what might have said a 27HP (Gross) on the sticker the same engine might say 24HP (Net) now. 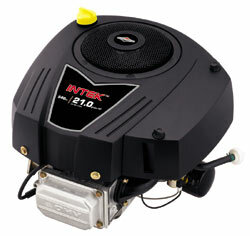 21B907-0029 / 219907-3029-G1 / 21R707-0011-G1 13.5 HP INTEK. Crankshaft Extension: 1" Diameter x 3 5/32" Length, Tapped 7/16" - 20, 1/4" Keyway. Shipping Weight: 84 lbs. Additional Feature: Auxiliary rewind. Features: Dura-BoreTM cast iron cylinder sleeve. Overhead valve design (OHV). Float carburetor for consistent easy starting. Dual-CleanTM pleated paper air filter with pre-cleaner. Patented linear balancing system (AVS). Less fuel tank. Starter: Electric Start with dual circuit alternator. Applications: Universal replacement engine for MTD, Murray, Snapper, AYP & other riding mowers & lawn tractors. Warranty: Consumer Use: 2 Years. Commercial Use: 1 Year. Has Choke-A-Matic Has Fuel Pump, NO Tank, NO Muffler. FOR AFTERMARKET AND OEM MIX USE THE CATEGORIES BELOW.